Delete the comma after world. If you keep the comma, you’re saying that the bit about points awarded defines utopian world, as in, this is a characteristic of all utopian worlds. Obviously that’s nonsense. In this context, government-approved is a compound adjective and needs a hyphen. I recommend changing the second deeds to ones to avoid a bit of clunkiness. 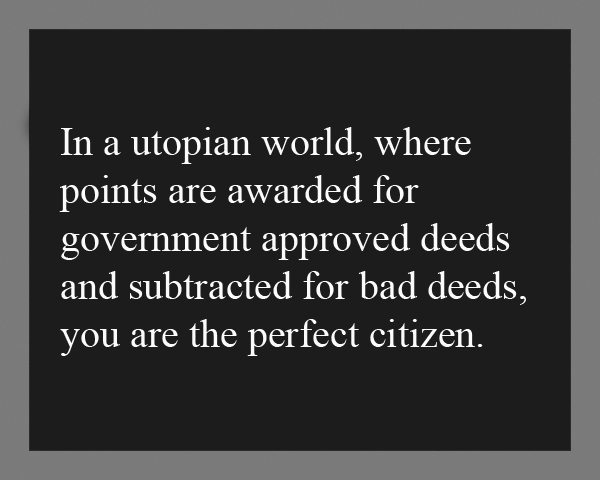 In a utopian world where points are awarded for government-approved deeds and subtracted for bad ones, you are the perfect citizen. Utopia: “You keep using that word. I do not think it means what you think it means.” I agree with you, sounds more hellish.